OSU fell *just* short of its first series sweep. STILLWATER — It was another three-game series that resulted in a two-win weekend for the Cowboys. 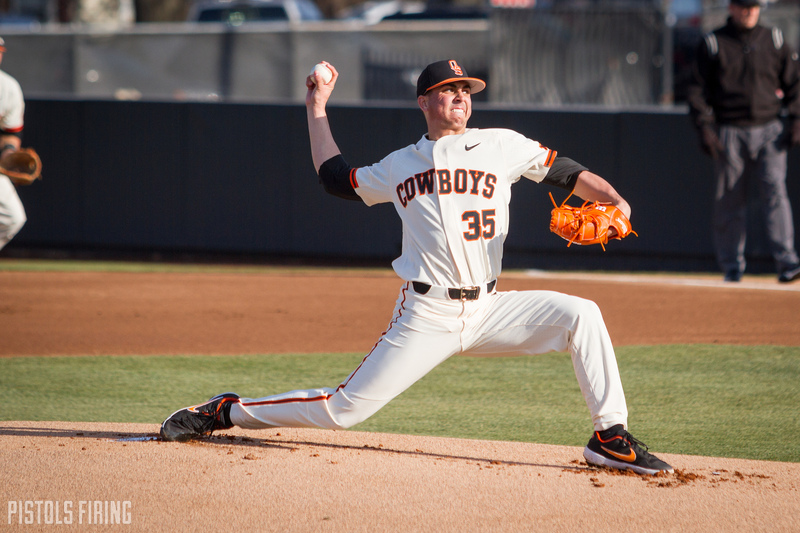 The Oklahoma State baseball team fell to Southeastern Louisiana 5-3 on Sunday, but the Cowboys won the series 2-1 after dominant performances Friday and Saturday. The Cowboys are 12-6 on the year and will play Dallas Baptist next at 6:30 p.m. Tuesday in Dallas. Here’s a recap of OSU’s series against Southeastern Louisiana. Colin Simpson was the go-ahead runner at the plate in the bottom of the ninth, but a groundout to second put an end to the Cowboys’ comeback hopes. There were a handful of moments in Oklahoma State’s 5-3 loss to Southeastern Louisiana on Sunday that had potential to allow the Cowboys to capture their first series sweep of the season, but the Cowboys fell short. Whether it be leaving seven runners stranded or the three or four balls that were caught at the warning track, it just didn’t come together for the Cowboys. A telling moment that it wasn’t the Cowboys’ day came in the second inning. With runners on first and second with two outs, Alix Garcia hit a ball hard on the ground to the right side. The ball was destined to get past SLU second baseman Brennan Breaud, but the ball hit Carson McCusker’s feet as he tried to jump over it on his way to second from first, ending the inning. That unlucky moment for the Cowboys was amended in the fourth inning when Christian Funk hit a fly ball to left. SLU left fielder Preston Faulkner lost the ball in the Stillwater sun. It hit the grass and resulted in two OSU runs. Funk had all three of the Cowboys’ RBIs on Sunday, as he also hit a sacrifice fly in the second that scored Bryce Carter. It was a rough day for OSU starting pitcher Mitchell Stone, who lasted only one 1/3 innings before getting pulled. Stone allowed three runs off one hit. He had three walks and a strikeout. Brett Standlee, Parker Scott, C.J. Varela, Nate Peterson and Ben Leeper were used in relief. OSU’s bullpen combined to give give up two runs off three hits while striking out eight and walking four. “We had our opportunities, that’s for sure,” OSU coach Josh Holliday said. “Built some innings and weren’t able to close them out, and they did a nice job at the end there of hanging on. Disappointed with the result. We had some opportunities, and we had some situations throughout the game that if we were a little bit better on one pitch here or there, the score mighta turned out different. The Cowboys started the season with a weekend rotation of Jensen Elliott, Logan Gragg and Mitchell Stone. Gragg hasn’t started either of the past two weekends but has picked up work in relief. In his place, Joe Lienhard started OSU’s 3-2 victory against Michigan last weekend, and Jake Lyons started Saturday’s 5-1 victory. Gragg, a junior who transferred to OSU from Connors State, has struggled at the start of his OSU career. He has allowed 13 runs in his first 13 1/3 innings of Division-I baseball and has a team-high 8.78 ERA. Gragg has played better in his past four appearances, all have come in relief. In those appearances, he has totaled five innings pitched, allowed three hits, one run and struck out five. The Cowboys have won series against UT-Rio Grande Valley, Wright State and Southeastern Louisiana, but have yet to sweep anybody this season. Holliday said he imagines the opportunity of a sweep is a known thing in the clubhouse but not something to dwell on. He said it’s a process to learn the mentality it takes to beat a team three days in a row, a process unique to baseball, as in other sports teams usually don’t meet back-to-back-to-back.